The cinematic sludge has added another feather to its cap. Pitaah cannot be categorized into either serious (art) or commercial cinema. It's like arthritis, in between and painful. Thakur (Om Puri) is the dictator of a rurally rustic village in Rajasthan, where he lives in a mansion that makes the Mysore Palace look like the commode from the washroom of the servant quarter in the fourth corner of that building. Now as a rule, a Thakur is a baddie. The murdering of Krishna (Salil Ankola) and his own daughter (Anupama Verma) shows the egotism and misanthropy of our antagonist. Not only that, but also the potency level of Zamindari libidos generally. Bhola and Bachchu are the stuck-up sons of the Thakur who would tell the police that they got mugged when they get hit by a cup. Their inheritance of the fraternal characteristics is aptly noticeable when they drool all over a mujrewali and lose mental stability when she leaves them hanging by a stiff happening. Being nymphomaniacs from birth, they try to dampen things through alcohol, but it only results in their transformation from one form of ugliness to another. They become pedophilic, and the unfortunate victim is Muniya (Tanvi Hegde), the 9-year-old daughter of Rudra (Sanjay Dutt). This is the point till which this can be called art cinema. The movie's awfully serious and disturbing. And you are still wondering why Sanjay Dutt was listed in the credits. Ram Narayan (Jackie Shroff) is introduced as a specimen police inspector with only a selective conscience. He apprehends the culprits but also entertains them in the cell while their robust dad fills his greedy pockets. Rudra, his wife (Nandita Das) and their twin sons are meanwhile preparing to avenge their daughter's mishap. Since they know that the Thakur's power can buy anything, Rudra hides in a closet of the courtroom with a rifle on Friday, so he can kill the guilty ones on Monday when they come for the hearing. What directorial genius! Rudra shoots Bhola and Bachchu and gets caught, only to be let off again by Ram Narayan when the latter learns that Rudra's family would then be in danger. But even before all this the family has decided to commit suicide (since the Thakur wouldn't leave them alive anyhow), and the twin kids have already done a "mujhe pehle zehar do, nahi, mujhe pehle zeher do" sequence. Mujhe pehle zeher do. Munia undergoes her surgery in a small dispensary, and this part of the movie is touchy. Too bad we're not impatiens capensis, that touch-me-not thing. The film could have ended when Ram Narayan points the revolver to the Thakur's head, but nope. Ram dies, and so it is left to Rudra to kill the Thakur himself, which he obediently does. The film is directorial rubbish, with props ranging from Gypsy-driving thakurayins to cabaret-dancing mujras. If such sensitive subjects aren't dealt with properly, they end up being vulgar. Sanjay Dutt's conversion from a more-faithful-than-a-dog servant to an angry father is impressive. Everybody has given a good performance, but we've seen him or her do better. 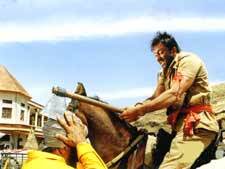 Jackie Shroff is the only happy part of the movie, and he dies. That itself talks about the film. You'd enjoy it only if you were the type to steal a free sample. fullhyd.com has 700,000+ monthly visits. Tell Hyderabad what you feel about Pitaah!